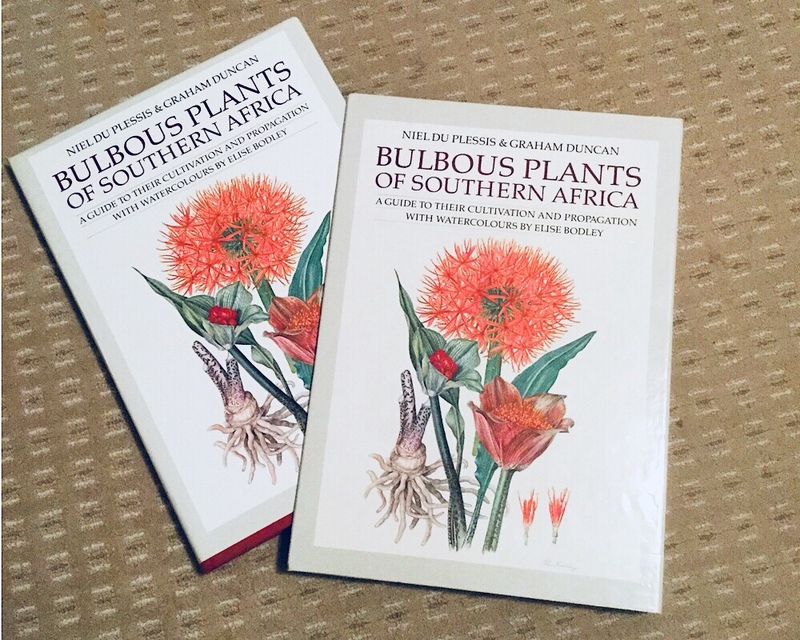 Bulbous plants of Southern Africa by Niel Du Plessis and Graham Duncan. Illustrations by Elise Bodley. ISBN 9780624026594 Tafelberg Publishers 1989. It begins with an extensive section on cultivation and propagation, with useful monochrome illustrations. The heart of the book consists of a treatment of the most desirable members of each genus, together with watercolours by Elise Bodley. In some cases the watercolours are mixed compositions from within one genus, others combine small genera from the same family. The thing I love most about this book is that one can tell it is aimed at gardeners. Many such books take a strictly botanical approach to ‘bulbs’ and restrict themselves to the ‘petaloid monocotyledons’. This excludes other plants that, for all practical purposes in the garden, behave the same way -i.e. spend part of the year as a dormant underground tuber. Therefore important genera such as Oxalis are usually excluded, as are tuberous Pelargonium, terrestrial Orchids etc. This book includes all of these, which is great to see. The selection of species and genera is excellent. There are a few smaller genera which are now quite trendy among the more geeky growers that are not included (Eriospermum for example). But all of the more popular ones are there. The text on each genus is very useful and contains many clues to cultivation. The watercolours by Elise Bodley are amazing. Both accurate and aesthetically very attractive, not always easy to do when combining a page of numerous similar plants (Oxalis for example). The book is beautifully presented in a sturdy slip-case but is very large which makes it awkward to fit on a shelf. Maybe😄. I just need a few more hours in the day! The art is just beautiful! !